This PI was superseded to update model list and recommendations. Please discard PIP5029D. The following diagnosis might be helpful if the vehicle exhibits the symptom(s) describedin this PI. 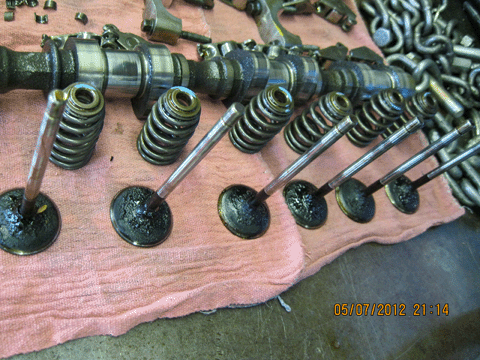 Some customers may complain of a MIL and engine misfire. In some cases, the misfiremay be more apparent on a cold start, may count on a single cylinder or several cylinders,and may or may not be felt by the driver. 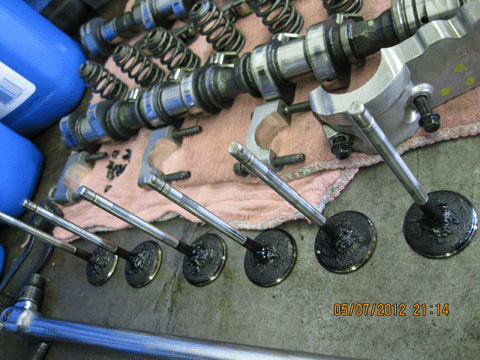 Upon inspection, the technician will findone or more misfire codes (DTC P0300-P0306) stored in the ECM and SI diagnosis mayor may not isolate the cause of the misfire depending on whether the intake/exhaustvalves are stickingat the time of the diagnosis. 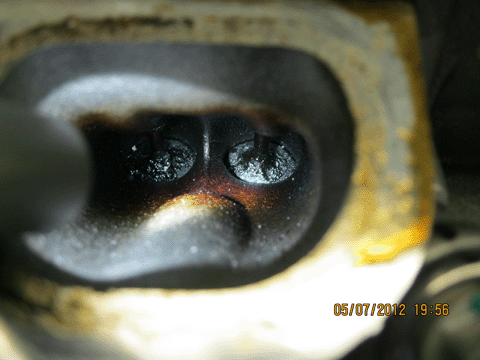 This may be the result of major carbon build up on the intake and/or exhaust valvesas shown below so the misfires should not have appeared until accumulating at least5,000 miles or more. Important:Extreme care must be taken not to hydro-lock the engine when inducing the cleaner,especially if it is induced without Kent Moore Tool # J-45076 / J-35800-A or equivalent.If too much cleaner is induced at too low of a RPM, or if you force the engine tostall by inducing too much cleaner at once, the engine may hydro-lock and bend a connectingrod(s). In a well-ventilated area with the engine at operating temperature, slowly/carefullyinduce a bottle of GM Upper Engine and Fuel Injection Cleaner into the engine withRPM off of idle enough to prevent the engine from stalling (typically around 2,000RPM or so). 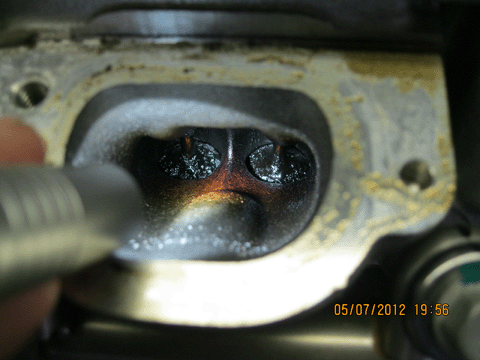 Depending on the engine configuration, induce the cleaner through thethrottle body or an engine vacuum hose/pipe. For best results, it is suggested toinduce the cleanerthrough the throttle body with Kent Moore Tool # J-45076 / J-35800-A or equivalent(shown below).Turn the engine off after inducing the cleaner and allow the cleaner to soak withthe engine off for 2.5 to 3 hours (Do not let cleaner soak for more than 3 hours asremaining deposits may start to harden back up again).Add a bottle of GM Fuel System Treatment Plus to the fuel tank and fill the vehiclewith one of the Top Tier gasolines listed at http://www.toptiergas.com and/or in thelatest version of 04-06-04-047 (USA) or 05-06-04-022 (Canada). See Bulletin 05-00-89-078for more details on GM Fuel System Treatment Plus.Test drive the vehicle extensively to circulate the GM Fuel System Treatment Plus.Re-evaluate the concern to determine if it is repaired or improved at all. 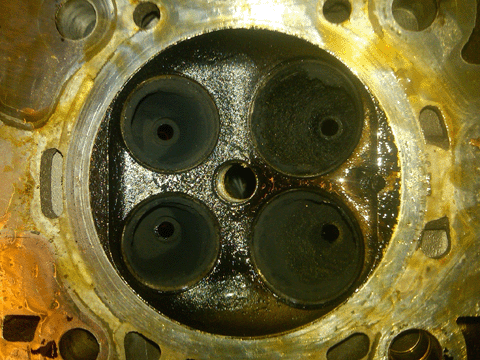 If theconcern is improved but not repaired, it may be necessary to perform the above decarboningprocess a 2nd time.To complete the repairs, change the engine oil and filter, and advise the customerto only use one of the Top Tier Gasolines listed at http://www.toptiergas.com and/orin the latest version of 04-06-04-047 (USA) or 05-06-04-022 (Canada) to minimize futuredeposits. It can also be recommended to add a bottle of GM Fuel System TreatmentPlus at every oil change as mentioned in the latest version of 04-06-04-051. The related training video on this topic for Canadian dealers is included in the March2013 TAC TALK presentation. The training video is available on the Learning ManagementSystem (LMS) Website and can be viewed by selecting the LMS link from the Global ConnectHome Page Go to Video On Demand from the Increase My Knowledge section. 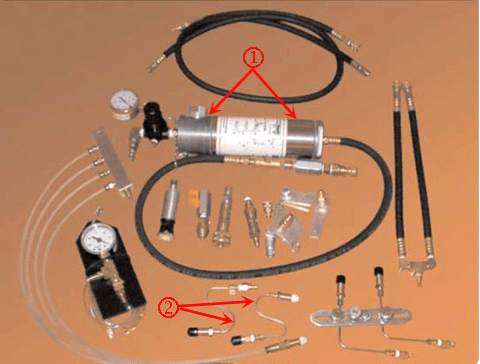 Once you haveselected the March 2013 TAC TALK, click on the Topics tab and then select #7 FeatureTopic- Procedure to De-Carbon Valves on Direct Injection Engines. 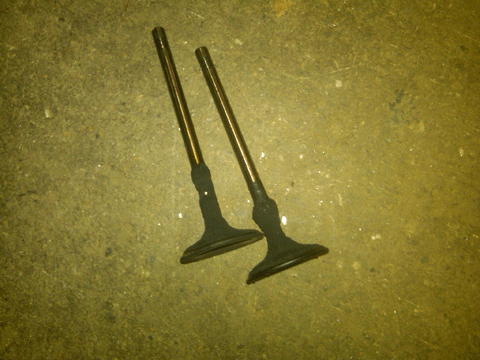 BG corp. Air Intake System Cleaning Tool Part # 9206 and used with BG 9210 injecta-flushaparatus. We believe these sources and their products to be reliable. There may be additionalmanufacturers of such products/materials. General Motors does not endorse, indicateany preference for, or assume any responsibility for the products or material fromthis firm or for any such items that may be available from other sources. * This is an unique labor operation for bulletin use only. This will not be publishedin the Labor Time Guide. Please follow this diagnostic or repair process thoroughly and complete each step.If the condition exhibited is resolved without completing every step, the remainingsteps do not need to be performed.